The European powers were moved at last. Fifty warships were sent to Beirut, and ten thousand French troops were landed in the Lebanon, to create order. Under the pressure of the European powers the Sublime Porte was forced to grant an autonomy for the province of the Lebanon. The French, English, German, Russian, Austrian, and, a year later, the Italian, Governments were signing the guaranty of this autonomy. Since then the Lebanon has had peace. The Governor of the province must always be a Christian, but the General Council of the Lebanon includes representatives of all the different races and religions of the population. A wonderful development began with the liberation from Turkish oppression. Macadamized roads were built all over the province, agriculture was improved, and there was complete safety for life and property. There is a proverb now in Palestine and Syria which says, "In the Lebanon a virgin may travel alone at midnight and be safe, and a purse of gold dropped in the road at midday will never be stolen." And the proverb told the literal truth. 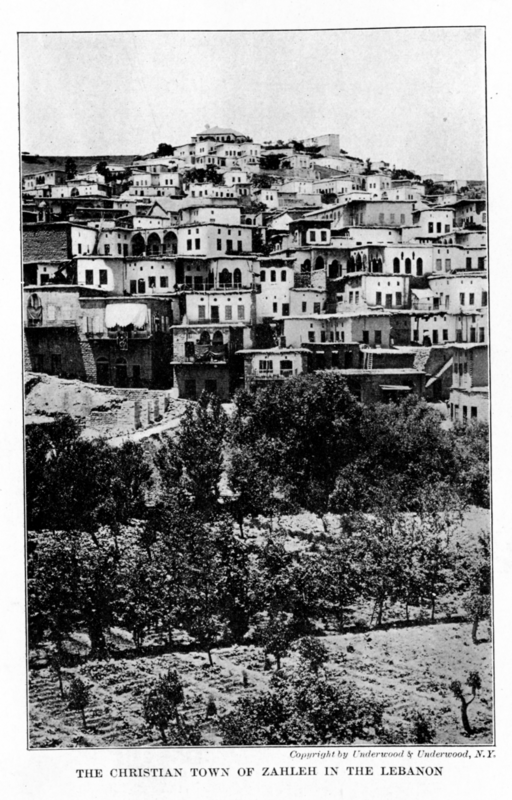 When one crossed the boundary from Turkish Palestine into the Lebanon province, what a change met his eyes!--peaceful and prosperous villages, schools filled with children, immense plantations of mulberry trees and olives, the slopes of the mountains terraced with beautiful vineyards, a handsome and sturdy population, police on every road to help the stranger, and young girls and women with happy laugh and chatter working in the fields. With a population of about six hundred thousand this province exported annually two million dollars' worth of raw silk, silkworm-raising being a specialty of the Lebanon. When autonomy was granted the Lebanon, French influence became predominant among the Maronites and other Christians of the province. French is spoken by almost all of them, and love for France is a deep-rooted sentiment of the people. On the other hand, the Druses feel the English influence. For the last sixty years England has been the friend of the Druses, and they have not forgotten it. It may be worth while to tell in a few words the story of one man who accomplished wonders in spreading the influence of his country. Sir Richard Wood was born in London, a son of Catholic parents. From his early boyhood he aspired to enter the diplomatic service. The East attracted him strongly, and in order to learn Arabic he went with another young Englishman to live in the Lebanon. In Beirut they sought the hospitality of the Maronite patriarch. For a few days they were treated with lavish hospitality, and then the patriarch summoned them before him and told them that they must leave the city within twenty-four hours. The reason for their disgrace they discovered later. Not suspecting that they were being put to the test, they had eaten meat on a Friday, and this made the patriarch think that they were not true Catholics, but were there as spies. Leaving Beirut in haste, Wood and his friend sought shelter with the Druses, who received them with open arms. For two years Wood lived among the Druses, in the village of Obey. There he learned Arabic and became thoroughly acquainted with the country and with the ways of the Druses, and there he conceived the idea of winning the Druses for England to counteract the influence of the French Maronites. He went back to London, where he succeeded in impressing his views upon the Foreign Office, and he returned to Syria charged with a secret mission. Before long he persuaded the Druse chieftains to address a petition to England asking for British protection. British protection was granted, and for over thirty years Richard Wood, virtually single-handed, shaped the destiny of Syria. It was he who broke the power of Ibrahim Pasha, the son of Mehemet Ali; it was he who guided Admiral Stopford in the bombardment of Beirut; it was he, again, who brought about the landing of English troops in Syria in 1841; we find him afterwards in Damascus as British Consul, and wherever he went he was always busy spreading English power and prestige. He understood the East thoroughly and felt that England must be strong in Syria if she wished to retain her imperial power. It is very unfortunate that the policy of Sir Richard Wood was not carried out by his nation. It was with high hopes and expectations that I approached the Lebanon. I was looking forward to the moment when I should find myself among people who were free from the Turkish yoke, in a country where I should be able to breathe freely for a few hours. But how great was my consternation, when, on entering the Lebanon, I found on all the roads Turkish soldiers who stopped me every minute to ask for my papers! Even then I could not realize that the worst had happened. Of course, rumors of the Turkish occupation of the Lebanon had reached us a few weeks before, but we had not believed it, as we knew that Germany and Austria were among those who guaranteed the autonomy of the Lebanon. It was true, however; the scrap of paper that guaranteed the freedom of the Lebanon had proved of no more value to the Lebanese than had that other scrap of paper to Belgium. As I entered the beautiful village of Ed-Damur, one of the most prosperous and enchanting places on earth, I saw entire regiments of Turkish troops encamped in and about the village. While I was watering my horse, I tried to ask questions from a few inhabitants. My fair hair and complexion and my khaki costume made them take me for a German, and they barely answered me, but when I addressed them in French their faces lit up. For the Lebanon, for all it is thousands of miles away from France, is nevertheless like a French province. For fifty years the French language and French culture have taken hold of the Lebanon. No Frenchman has more love for and faith in France than lie in the hearts of the Lebanese Christians. They have never forgotten that when massacres were threatening to wipe out all the Christians of the Lebanon, ten thousand French soldiers swept over the mountains to spread peace, life, and French gayety. I could not help wondering at the mistakes of the Allies. If they had understood the situation in Palestine and Syria, how differently this war might have eventuated! The Lebanon and Syria would have raised a hundred thousand picked men, if the Allies had landed in Palestine. The Lebanon would have fought for its independence as heroically as did the Belgians. Even the Arab population would have welcomed the Allies as liberators. But alas! With a saddened heart I pursued my journey into Beirut. My coming was a joyful surprise to my sister. Many sad things had happened since she had last seen me. During my imprisonment she had suffered tortures, not knowing what would happen to me, and now that she saw me alive she cried from happiness. She told me how kindly she had been treated by President Bliss, of the Syrian Protestant College, and of all the good things the college had done. What a blessing the college was for the people of Beirut! Many unfortunate people were saved from prison and hardships through the intervention of President Bliss. He never tired of rendering service, wonderful personal service. But alas, even his influence and power began to wane. The American prestige in the country was broken, and the Turkish Government no longer respected the American flag. An order issued from Constantinople demanded that the official language of the college be Turkish instead of English, and Turkish officers even dared to enter the college premises to search for citizens belonging to the belligerent nations, without troubling to ask permission from the American Consul.